I saw a great deal of woo-hooing on Facebook on Friday after the Supreme Court granted hearings in two gay marriage cases. From what I’m reading, the elation is a little premature. The menu of options open to the justices, especially in the California Prop 8 case, range all over the map, from outlawing gay marriage restrictions everywhere (woot!) to finding absolutely no constitutional basis for gay rights (OMG!). 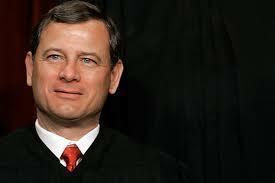 It may all come down to Chief Justice John Roberts and how he wants history to view him. It’s said that no Supreme Court ever likes to get too far out in front of the people. But it’s also a given that the truly great Justices have been well ahead of the people and have actually led them where many feared to tread. Chief Justice John Marshall established definitively the right of the courts to interpret the law. Chief Justice Earl Warren took society away from segregated schools and incidentally also led the Court in striking down state prohibitions against interracial marriage (in Loving v. Virginia, 1967), which is a pretty interesting precedent for the current docket. Roberts has already freed himself from the airless, conservative box of Scalia/Thomas/Alito, in the recent ruling on Obamacare, and he may want to step out again on gay marriage. If he doesn’t want to lead boldly but nevertheless sees clearly where this society is headed eventually, then we would expect a ruling that is incrementally good for gay marriage but is something far more timid than we would like. 1. United States v. Windsor is a challenge to the 1996 law of Congress, the Defense of Marriage Act (DOMA), which defined marriage for all federal purposes as a union of one man and one woman. Everyone I’m reading on SCOTUS blog seems sure that this court will strike down DOMA. But striking down the federal definition of marriage will not necessarily address the underlying Constitutional issue of whether there is a right to gay marriage. 2. Hollingsworth v. Perry is the California Prop 8 case and is generally considered the epicenter for all earthquakes that may come from the High Court's decision to open the gay marriage argument. In their order granting a hearing in this case, the Supremes requested the lawyers to brief them on the legal issues of standing, which is a warning that the Court might take the narrow view and follow the lead of the Ninth Circuit Court of Appeals, find that those clamoring to take away the right of marriage from gay people have no legal standing to be suing in this case and thereby uphold the overturning of Prop 8. If this is the path the Court takes, then gay marriage could be ruled legal in California only (since the state had already approved gay marriage prior to Prop 8). Even more narrowly, the Court could rule that gay marriage is legal in just two counties of California, where county clerks had refused to issue marriage licenses after the passage of Prop 8 and were subsequently named in the complaint that has now landed at last on the docket of the Supreme Court. Romer v. Evans ... invalidated a Colorado constitutional amendment enacted through a plebiscite that stated that there could be “no protected status” on the basis of gay, lesbian, or bisexual identity. The constitutional amendment in question (Amendment 2) superseded anti-discrimination laws protecting gays that had been passed by progressive cities in Colorado. Those cities were blue dots in a red state. Amendment 2 invalidated those municipal ordinances and, going forward, prohibited the state or any of its subdivisions from enacting a similar kind of anti-discrimination ordinance. The Supreme Court struck down the Colorado amendment under the Equal Protection Clause without specifying a level of scrutiny. It observed that Amendment 2 was “at once too narrow and too broad” — it singled out a group of people on the basis of a single trait and then denied them protections across the board. The sweeping nature of the disability on a small group of people effectively made gay individuals “strangers” to the law. The Court stated that the imposition of such harm could only be explained by animus. In the Perry case, the Ninth Circuit panel detected the same animus. One problem with the panel’s analysis was that Prop. 8 eliminated only one right — the right to marry. The panel acknowledged this distinction, saying that animus could be present even (or perhaps especially) when a state enacted legislation with “surgical precision.” Yet this interpretation extends Romer, which repeatedly emphasized the breadth of the harm imposed by Amendment 2 as part of what was constitutionally objectionable about it. This objection, however, simply means that Romer, standing alone, may not dispose of Perry. Because they are both gay-rights cases involving ballot measures, the understandable tendency has been to link Perry with Romer. Yet Romer is but one member of a family of cases in which the Court has invalidated laws that lacked a rational basis. Many of these cases invalidated laws much narrower than Prop. 8. In City of Cleburne v. Cleburne Living Center, the Court struck down a city zoning ordinance that discriminated against individuals with mental disabilities, applying equal protection rational basis review. Similarly, in United States Department of Agriculture v. Moreno, the Court struck down a portion of a federal food stamps program that discriminated against “hippies.” The best reading of these precedents is that the problem with legislation based solely on animus is the animus, not the breadth of the legislation. Such breadth is but one of the many possible indicia pointing to the existence of animus. Reading legal analysis written by high-powered lawyers can seem a house of mirrors, but I find it pretty stimulating on this particular subject. If you want to read more, SCOTUS blog has been my indispensible source, particularly this and this and this and the above. Pat McCrory Seals the Deal: "I'm a Puppet!" Kevin Siers, in today's Charlotte Observer. Serious Question: Are NC Republicans Crazy?